Alan Rubin has been producing cigars since the late ’90s through his company Alec Bradley (the first names of his two sons), but until 2008 none of his cigars had been commercialized explicitly under the brand name. Things changed dramatically when in early 2008 Rubin launched the Alec Bradley Tempus, carrying the brand name on the cigar band for the first time and pushing the already well-established company in the cigar makers elite. Launched in 6 formats, plus the limited signed production Magistri (a figurado – only 1000 boxes where made of this in 2008) the Tempus range quickly gained recognition, with Cigar Aficionado giving impressive scores between 88 and 94 to the whole range and recognizing the Tempus Centuria as one of its 2008 top 25 cigars (albeit at place 25). A couple of notes before starting. The information on the cigar make-up is from the AB website. I am not sure why two tobaccos are listed as binder; either these have two binder leaves or maybe different formats have a different binder. If anyone has a clue I’d love to hear about it. The Quadrum does not appear on the Alec Bradley Tempus page, making me think this is an extension of the original line. It is worth mentioning that the Tempus is made by the small Raices Cubanas factory in Honduras which also produces many of the Illusione cigars and the new Di Fazio brand… considering the success of the Tempus and Illusione it makes me wonder how much of the merit actually goes to the makers of the cigar instead of the ones that commercialize them. Aesthetically the presentation is beautiful. Generally I am not a great fan of either foot bands (opening pic) or gold bands, but whoever designed these made a great work as these really are classy. You know how you always need a few puffs for a cigar to warm up and show its flavour…? Not here mate! I was really stunned at the opening and complexity of the first part of the Quadrum. It opens on intense white pepper notes on an earthy cocoa background, then the spice mellows a bit and the cocoa gains coffee notes and a sweet finish that reminds me of maple syrup. That would be quite an impressive start but before the transition to the middle section the cigar taste changes; the coffee and cocoa become a hint and the spice is now accompanied by licorice and light floral notes. On top of that the cigar is extremely smooth, even with the initial spice. The body is on the lower end of full. In the construction department, nothing to complain: the burn is just ever so slightly wavy, the ash has a decent length (just a little flaky) and the amount of creamy smoke produced is impressive. In the middle section the cigar is less explosive than the start, but equally impressive if more consistent. The licorice note slowly gives way to more woody and nutty aromas with floral notes and a long coffee and spice finish. Everything else is pretty much as before except the burn that starts canoing more and more towards the last section. The finishing stertch doesn’t start in the best way. The burn gets out of control and I have to correct it twice in close succession. During this the smoke is a bit rough and overheated, more because of the whole burn issues than for problems with the cigar itself. As if to prove this, once the stick cools down the flavours become clearer, but slightly more subdued than before, with wood and leather on a slightly bitter coffee and dark caramel note. Although not bad at all – I might have even been impressed with it in a different stick- the end of the cigar was a bit disappointing because it didn’t stand up to how the smoke had been up to that point. Absolutely. Although not perfect, this is a stunning and smooth full bodied smoke that is the first to get an impressive 90 points (and BTW, yes, I grade quite lower than C.A. does). I would happily smoke the Tempus again (and again… and again…), especially after a nice meal which I think would be the best time for these. 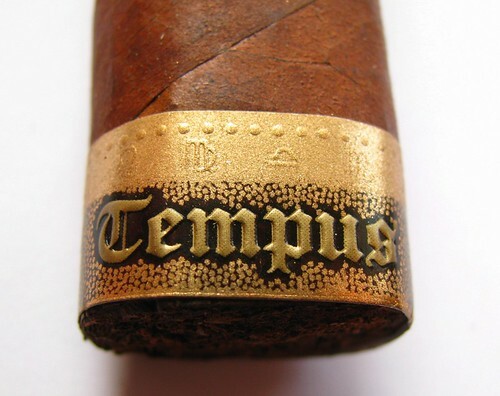 I find the price very fair for the quality and I’ll certainly try to land a few different formats of the Tempus to try in the future (in particular any between the Creo, Centuria, Imperator and Magistri) before deciding which box to buy. If you haven’t had one, definitely give the Alec Bradly a try, it’s well worth it. This entry was posted in Cigar Reviews, Honduran and tagged Alec Bradley, Cigar Review, Honduras cigars, Quadrum, Tempus. Bookmark the permalink. I have an Alec Bradley 1997 Harvest Selection maturing in the humidor…!!! I received one of these yesterday in a monthly cigar club. Look forward to hear what you think Yiorgos.